Organizations must digitally transform to deliver a differentiated experience. It is no longer a luxury but a necessity for survival. The explosion of new technologies and touchpoints, such as chatbots, mobile messaging apps, augmented reality, and two-way video chat has dramatically changed the face of customer engagement. Today's customers value these new digital experiences. Selfies, stories, chats, and influence stats grab their attention and they feel compelled to share their personal encounters. Today's empowered customers have access to more information, choices, and opportunities, redefining the ideal experience. They decide what they want and where and how they want it. They dictate the terms of engagement with businesses. They demand new modes of digital engagement that shift commerce and service from independent interactions to on-going conversations. New digital channels are clearly transitioning away from traditional channels toward new forms of communication, whether engaging in assisted service or self-service transactions. Yesterday's world was about one-way interactions; today's is about self-directed, on-demand, intelligent conversations anywhere, on any device. 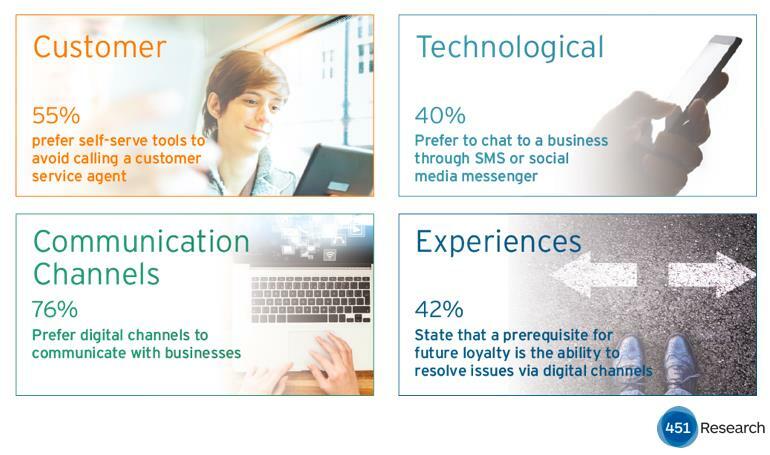 Customers want to communicate on their terms in their preferred channels. Depending on the urgency, nature, and overall context of the customer's situation, self-service is one of the most effective engagement options, with many conversations beginning on mobile devices. Recent 451 Research data shows a preference for digital channels, with 55 percent of survey respondents preferring self-serve tools to calling customer service agents. A hot trend leading the digital transformation is conversational technologies using machine learning that can nurture relationships across the customer journey to trigger contextual responses throughout the customer lifecycle. This includes all conversations related to consumer engagement and purchase conversions through new channels, such as SMS, web, or mobile chat (e.g., WhatsApp, LINE WeChat, Snapchat), or social interactions on Twitter, Facebook, or Instagram using links or buy buttons. While this trend is still in its infancy, we predict that 80 percent of all customer interactions will eventually be contained in a self-service channel with the option to escalate to an assisted service channel while keeping the conversation in context to the situation. New conversational technologies enable a frictionless buying journey, from product discovery and order to mobile payments, tracking order status, and providing customer service. For years, customer service has been struggling to shift from a cost center to a profit center. A renewed focus on serving rather than selling will re-invigorate the shift from traditional call centers to engagement centers, which will spur investments in more intelligent automation and conversational approaches to service and commerce. The power of data combined with machine learning algorithms is redefining the future of customer experiences to be more intelligent and drive better outcomes. However, without an underlying data layer to ensure the accuracy of the response, the experience will not succeed at meeting the business objectives of call deflection and customer conversions. Businesses can also harness the power of large volumes of data with chatbots that can intelligently scale. These conversational tools can be used to create personal concierges in self-service or even assisted-service engagements. Users can text or chat restaurant reservation requests, get product information based on contextually relevant data, or place orders without adding to their shopping carts. These engagement tools work most effectively when integrated into transactional e-commerce systems. For example, a customer could type or speak "Find me red platform shoes for under $150." (Additionally, rich media elements can be included, such as a picture of the desired item to trigger product discovery and inventory availability.) The customer would then get a personalized product recommendation along with express shipping selected and color and size already accounted for; they can pay and track shipping status all within the confines of a digital mobile conversation. If a service request is needed, depending on the complexity, it can be handled through an automated self-service conversation or automatically escalated to a customer service representative. Technology is quickly becoming the catalyst for one of the most profound changes ever to occur in the relationship between individuals and the world around them. Business are redefined from a transactional relationship between people into a more nuanced, tangled relationship between humans and the automated systems and devices they use to engage the world. The upcoming Customer Service Experience event will have insights from practitioners who have already paved the way for you through their own experiences and have the battle scars to prove it. You'll hear case studies from leading brands, best practices from industry luminaries, and how-tos from those on the front lines of the new customer service reality. This year, our hands-on conference features two tracks. The first track will focus on the end customer's experience of service, including ways to provide friction-free service. The second track will be squarely centered on the experience of customer service representatives and contact center agents, including ways to drive greater agent engagement and tools to better arm your staff to solve increasingly complex service issues. Sheryl Kingstone is research director for business applications at 451 Research and co-chair of the Customer Service Experience Conference, being held this year in Washington April 24-26. According to a new study, consumers are opting to use technology to help them throughout the purchase process, and they don't want to interact with store associates unless they need help.